This is a self-paced course. Multiplication is our most requested course topic – and it’s so much more than times tables! We are going to do something very new, to us and to the online course format in general. Want to learn more about our approach to learning, and the big WHYs behind this course? Here is Dr. Maria Droujkova’s short presentation. First, what’s so special about multiplication? To begin with, it is universal and therefore unavoidable. We all had to learn it. And our children will have to learn it too, in some shape or form. Here’s something else – the way you will help your children learn multiplication will mirror the way you learned it yourself, unless you take steps to change that. So how did you learn? Did you spend hours repeating “the facts” with chants, flashcards, and seemingly endless drills? A lot of things have changed since we were children. There must be more effective ways of mastering multiplication! And there must be ways to make it relevant to our lives! Let’s dig deeper. Do you remember how you felt studying the multiplication tables? For so many people we meet, the dislike and fear of math can be traced all the way back to their struggles to understand (and not just memorize) multiplication. Can we change this pattern so our children, approaching multiplication, feel not fear but curiosity, not anxiety but joy, not alienation but affinity? Can multiplication be more about smart play, rich mathematical thinking and usefulness everywhere in life? This is what our Multiplication Explorers course is all about. It explores holistic approach to learning multiplication. Memorization based on smart number patterns is a part of it. The course also includes bridges between multiplication and natural world, as well as links to many virtual and imaginary worlds in books, music, technology, art, and games. We invite you to boldly go beyond the familiar representations of multiplication such as skip counting and repeated addition, to explore many more meaningful, beautiful, and fun models. This course is a launch pad to adventures across the universe of multiplication. What exactly will you find in the Multiplication Explorers course? For the purposes of sorting activities, the course comes in 3 weeks – enough time to establish new habits. You can pace it slower or faster. The goal is for you to review multiplication-based games and activities and then do them with your children. You can do an activity a day or choose a schedule that best fits your family or group. The course has tools for adapting activities to fit your unique needs – see FAQ for details. Most of the activities have no pre-requisites, plus we give you lots of ideas for adapting them for younger (ages 3-5) and older (13+ ) children. Which means you do not have to think about how to occupy your youngest while you are playing math with your oldest, or the other way around. A single activity can take you as little as 10 minutes or as long as a couple of hours, depending on how much your child and you get into it. There are several that are so addictive that we are still playing the games ourselves many years after starting! You will also need 15-30 min to prepare by reading through activity description and, ideally, trying it out yourself. You will not need to buy or make any math manipulatives for any of the activities. While your participation and gentle guidance are essential at the start of every activity, children can successfully continue their explorations without you, as long as there are plenty of LEGOs, construction paper, markers, and yarn. Week 1 – Inspired by Calculus – Yes, we are starting big and bold! 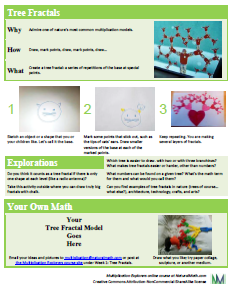 We will call on some of the most beautiful mathematical ideas, such as fractals, to help model multiplication. We will travel across the physical universe from things unimaginably small to mind-bogglingly large. And we will build and draw models, lots of models. Week 2 – Inspired by Algebra – Remember that Algebra 1 class? This will be nothing like it, we promise! Because we take algebra to Wonderland, making it accessible and engaging for anyone between the ages of 3 and 103+. 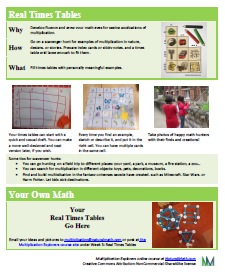 We will show you and your child how to explore multiplication with snowflakes and kaleidoscopes. You will design fantasy animals with combinatorics, and seek patterns in anything from doodles to word games. Week 3 – Times Tables – No silly incantations in our multiplication course! Work smart, seek beauty, and go for patterns. This is the week when you will create your own grand tables, discover hidden and exotic patterns within, and hunt for multiplication in plain sight. Multiplication tricks will be discussed and their inner workings will be revealed. And you will learn about healthy, anxiety-free approaches to memorizing the tables. This is a Name-Your-Price course and you can choose your levels of participation and your type of interaction. You can dial the suggested price up and down, from $1 to infinity. Multiplication Explorers course emails with inspiration and reminders, delivered to you for several weeks after you subscribe. Access to 15 engaging math activities that will help you and your child look at multiplication as something fun and fascinating. Use a badge system to manage and track your progress through activities. 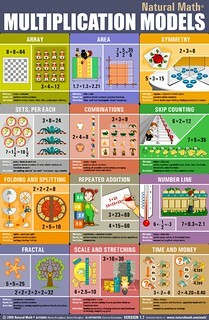 Printable one-page ref cards that summarize each activity, its key words, good questions, and what math children make. Take the card with you when you run the activity with children, so you remember how it goes. Unlimited access to the online community of parents and teachers. 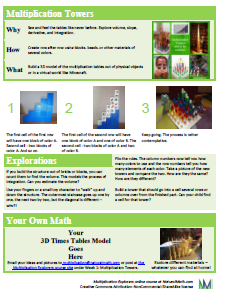 If you pay $45 or more, you will get all of the above plus our very popular Models of Multiplication poster. If you pay $95 or more, you will get all of the above plus two live online consults with Maria Droujkova, which we will schedule with you individually. We will talk about adaptations of activities for your children’s needs and interests, as well as your questions, ideas, and concerns. 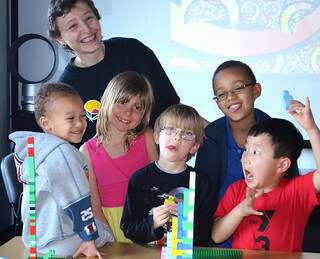 All the activities in the course have been tested by thousands of children and adults of all ages and skill levels. When we say you and your child will enjoy this course, we speak from experience! In case you have questions, check out the list of Frequently Asked ones. If you took the course before, head to that page to see what changed and how you can play with the new content. We can’t wait to see you in the Multiplication Explorers Course. Register now! Ok…how do I download the materials now that I have paid? Hi Lisa, you should have received an email from moby@moebiusnoodles.com with a download link. The file there explains that you get access to the course materials when the course starts in April. Please let me know if you have other questions! I did not receive a link either. I received the pdf and paypal payment receipt. Lisa and Kim, thank you for checking on your invites! We just ended registration for this session 6 minutes ago as of this writing, so everybody’s info packages will be on their way in the next couple of hours. I already took a note to change this process next time around. We will have a list of things people will receive, from what email addresses, and when. See you very soon in the course! I registered before your 6 minute cut off. If it remains too late please clarify what happens now. Thanks again. I have your registration, and you are in! About two hours from now (1 pm Eastern US on February 9) you should receive a greeting email from moby@moebiusnoodles.com with instructions. We were waiting for the registration to end before sending anyone anything. But I’ll set up a better process next time around! Your comments help. Thanks again. Sorry to bother you again. Did I miss what time the online class is today? When the countdown clock was online, I thought that meant the start to the class was 11 am. I don’t see the time listed anywhere. Is it a recording or a live stream? I just want to run a few errands and then be settled so I won’t miss a thing. Thanks a bunch. Kim, today’s happenings are not live and not tied to particular times – just on the forums and in recordings. You can do everything on your own time. Same problem. I’ve been thinking all morning I’d be getting an email with a link but nothing so far. I received my receipt. Amber, I have your registration. Information is coming soon. Sorry about this logistics issue, everybody! I wanted to do the course this session, but had to admit that life with a newborn is too hectic. I sent my registration info and payment for April, to make sure that this happens in the spring! Darn! I missed the February class- I did not realize there was a cutoff time. I just found your website on Sunday and we were super excited about it! I don’t suppose we can register late? We will participate in April but just really needing a fun math supplement for my 7 year old! I can’t access course forum. I haven’t recieved an e-mail with forum setup yet (checked my spam folder). Can you send me this e-mail? or maybe my order doesn’t include forum access? I paid the course at Moebius Noodles at january 27. Thank you for great course! My nephew likes math activities from every lesson very much! Irina, glad your nephew likes math activities! Yes, forums are included with the course, at all levels. We are investigating what happened to your forum access, which you are supposed to have. I also emailed you about it with some questions. I hope to see you on the forums very soon! We are halfway through and SO love this course. My 8 year old just thinks it’s amazing and often says her favourite thing in the day is math! I’m having fun too (and I usually don’t enjoy math) and we can include our 4 year old easily in most of the activities. Can’t wait to do the next course! I am very glad to hear that! Thank you for sharing. Kelly, can you ask your children (and maybe yourself) if they would like to share what they do in some form, or involve other course participants? I am trying to redesign the interactions for next time around. I don’t think forums are inspirational enough. I too signed up for the course several months ago and have the introductory pdf where it says i’ll receive further instructions but never did. how do I access this course or get my $45 back? Sorry you had this issue! The difficulty is that the payment email is sometimes not the email address people actually use. We’ve since addressed that by changing the sign-up process so people can tell us a separate email address for the course. I emailed you about it – please let me know if you don’t receive my letter. Hope to see you in the course soon! So, is this only available at certain times? Or can I sign up for it and do it with my kids whenever we want? Brittany, you can sign up now and start it with your children right away! Let me know if you need any help. I signed up this morning and found the welcome type pdf on the invoice,but can’t find any info on how to actually get into the materials. I thought maybe a time difference thing and you’ll send more info individually, but thought I better check? A Spring glitch strikes back! The automated system has worked well for a while, but now it needs attention again. Thank you for letting us know. You should be all set by now. 2 Pings/Trackbacks for "Multiplication Explorers Online Course"